Dry substance: Ceftriaxone disodium hemi heptahydrate 298.2 mg equivalent to 250 mg ceftriaxone per vial. Solvent: Lidocaine hydrochloride monohydrate 21.33 mg equivalent to 20 mg lidocaine hydrochloride, water for injection q.s. 2 ml of solution. Solvent: Water for injection 5 ml. Dry substance: Ceftriaxone disodium hemi heptahydrate 596.5 mg equivalent to 500 mg ceftriaxone per vial. Dry substance: Ceftriaxone 1 g as disodium hemi heptahydrate per vial. Solvent: Lidocaine hydrochloride monohydrate 37.3 mg equivalent to 35 mg lidocaine hydrochloride, water for injection q.s. 3.5 ml of solution. Solvent: Water for injection 10 ml. Dry substance: Ceftriaxone disodium hemi heptahydrate 2386.0 mg equivalent to 2000 mg ceftriaxone per vial. Complicated urinary tract infections (including pyelonephritis). Infections of bones and joints. Complicated skin and soft tissue infections. For treatment of acute exacerbations of chronic obstructive pulmonary disease in adults. For treatment of disseminated Lyme borreliosis (early [Stage II] and late [Stage III]) in adults and children including neonates from 15 days of age. For Pre-operative prophylaxis of surgical site infections. In the management of neutropenic patients with fever that is suspected to be due to a bacterial infection. In the treatment of patients with bacteraemia that occurs in association with, or is suspected to be associated with, any of the infections listed above. EPICEPHIN should be co-administered with other antibacterial agents whenever the possible range of causative bacteria would not fall within its spectrum. (see Warnings and Precaution). Consideration should be given to official guidelines on the appropriate use of antibacterial agents. A single intramuscular dose of EPICEPHIN 1-2 g can be given. Limited data suggest that in cases where the patient is severely ill or previous therapy has failed, EPICEPHIN may be effective when given as an intramuscular dose of 1-2 g daily for 3 days. For initial treatment of acute otitis media, a single intramuscular dose of EPICEPHIN 50 mg/kg can be given. Limited data suggest that in cases where the child is severely ill or initial therapy has failed, EPICEPHIN may be effective when given as an intramuscular dose of 50 mg/kg daily for 3 days. 50-80 mg/kg once daily for 14-21 days. The recommended treatment durations vary and national or local guidelines should be taken into consideration. EPICEPHIN is contraindicated in premature neonates up to a postmenstrual age of 41 weeks (gestational age + chronological age). For initial treatment of acute otitis media, a single intramuscular dose of EPICEPHIN 50 mg/kg can be given. The generally recommended dose is 50 mg/kg once daily for 10-14 days. The dose recommendations in syphilis, including neurosyphilis, are based on very limited data. National or local guidance should be taken into consideration. The duration of therapy varies according to the course of the disease. As with antibiotic therapy in general, administration of EPICEPHIN should be continued for 48-72 hours after the patient has become afebrile or evidence of bacterial eradication has been achieved. In patients with impaired renal function, there is no need to reduce the dosage of EPICEPHIN provided hepatic function is not impaired. Only in cases of preterminal renal failure (creatinine clearance < 10 ml/min) should the EPICEPHIN dosage not exceed 2 g daily. In patients undergoing dialysis, no additional supplementary dosing is required following the dialysis. Ceftriaxone is not removed by peritoneal- or haemodialysis. Close clinical monitoring for safety and efficacy is advised. EPICEPHIN can be administered by deep intramuscular injection. Intramuscular injections should be injected well within the bulk of a relatively large muscle and not more than 1 g should be injected at one site. As the solvent used is lidocaine, the resulting solution should never be administered intravenously. EPICEPHIN can be administered by intravenous infusion over at least 30 minutes (preferred route) or by slow intravenous injection over 5 minutes. Intravenous intermittent injection should be given over 5 minutes preferably in larger veins. Intravenous doses of 50 mg/kg or more in infants and children up to 12 years of age should be given by infusion. In neonates, intravenous doses should be given over 60 minutes to reduce the potential risk of bilirubin encephalopathy (See Contraindications and Warnings and Precautions). Intramuscular administration should be considered when the intravenous route is not possible or less appropriate for the patient. For doses greater than 2 g, intravenous administration should be used. EPICEPHIN is contraindicated in neonates (≤ 28 days) if they require (or are expected to require) treatment with calcium-containing intravenous solutions, including continuous calcium-containing infusions such as parenteral nutrition, because of the risk of precipitation of ceftriaxone-calcium (See Contraindications). Diluents containing calcium, (e.g. Ringer’s solution or Hartmann’s solution), should not be used to reconstitute EPICEPHIN vials or to further dilute a reconstituted vial for intravenous administration because a precipitate can form. Precipitation of ceftriaxone-calcium can also occur when ceftriaxone is mixed with calcium-containing solutions in the same intravenous administration line. Therefore, EPICEPHIN and calcium-containing solutions must not be mixed or administered simultaneously (See Contraindications and Warnings and Precautions and Incompatibilities). For pre-operative prophylaxis of surgical site infections, EPICEPHIN should be administered 30-90 minutes prior to surgery. For instructions on reconstitution of the medicinal product before administration, see Special Precautions for Disposal. Hypersensitivity to ceftriaxone, to any other cephalosporin or to any of the excipients. Previous immediate and/or severe hypersensitivity reaction to a penicillin or to any other beta-lactam medicinal products. Premature neonates up to a postmenstrual age of 41 weeks (gestational age + chronological age)*. - if they require (or are expected to require) intravenous calcium treatment, or calcium-containing infusions due to the risk of precipitation of a ceftriaxone-calcium salt (see Warnings and Precautions, Undesirable Effects, Incompatibilities). Contraindications to lidocaine must be excluded before intramuscular injection of ceftriaxone when lidocaine solution is used as a solvent (see Warnings and Precautions). See information in the Summary of Product Characteristics of lidocaine, especially contraindications. EPICEPHIN solutions containing lidocaine should never be administered intravenously. Special caution is required to determine any other type of previous hypersensitivity reactions to penicillin or to other beta-lactam medicinal products because patients hypersensitive to these medicines may be hypersensitive to EPICEPHIN as well (cross- allergy). As with all beta-lactam antibacterial agents, serious and occasionally fatal hypersensitivity reactions have been reported (see Undesirable Effects). In case of severe hypersensitivity reactions, treatment with ceftriaxone must be discontinued immediately and adequate emergency measures must be initiated. Before beginning treatment, it should be established whether the patient has a history of severe hypersensitivity reactions to ceftriaxone, to other cephalosporins or to any other type of beta-lactam agent. Caution should be used if ceftriaxone is given to patients with a history of non-severe hypersensitivity to other beta-lactam agents. Severe cutaneous adverse reactions (Stevens Johnson syndrome or Lyell’s syndrome/toxic epidermal necrolysis) have been reported; however, the frequency of these events is not known (see Undesirable Effects). In patients of any age, ceftriaxone must not be mixed or administered simultaneously with any calcium-containing intravenous solutions, even via different infusion lines or at different infusion sites. However, in patients older than 28 days of age ceftriaxone and calcium-containing solutions may be administered sequentially one after another if infusion lines at different sites are used or if the infusion lines are replaced or thoroughly flushed between infusions with physiological salt-solution to avoid precipitation. In patients requiring continuous infusion with calcium-containing total parenteral nutrition (TPN) solutions, healthcare professionals may wish to consider the use of alternative antibacterial treatments which do not carry a similar risk of precipitation. If the use of ceftriaxone is considered necessary in patients requiring continuous nutrition, TPN solutions and ceftriaxone can be administered simultaneously, albeit via different infusion lines at different sites. Alternatively, infusion of TPN solution could be stopped for the period of ceftriaxone infusion and the infusion lines flushed between solutions (see Contraindications, Undesirable Effects, Pharmacokinetic properties, Incompatibilities). Safety and effectiveness of ceftriaxone in neonates, infants and children have been established for the dosages described under Dosage and Administration (see Dosage and Administration). Studies have shown that ceftriaxone, like some other cephalosporins, can displace bilirubin from serum albumin. EPICEPHIN is contraindicated in premature and full-term neonates at risk of developing bilirubin encephalopathy (see Contraindications). An immune-mediated haemolytic anaemia has been observed in patients receiving cephalosporin class antibacterials including EPICEPHIN (see Undesirable Effects). Severe cases of haemolytic anaemia, including fatalities, have been reported during EPICEPHIN treatment in both adults and children. Antibacterial agent-associated colitis and pseudo-membranous colitis have been reported with nearly all antibacterial agents, including ceftriaxone, and may range in severity from mild to life-threatening. Therefore, it is important to consider this diagnosis in patients who present with diarrhoea during or subsequent to the administration of EPICEPHIN (see Undesirable Effects). Discontinuation of therapy with EPICEPHIN and the administration of specific treatment for Clostridium difficile should be considered. Medicinal products that inhibit peristalsis should not be given. In severe renal and hepatic insufficiency, close clinical monitoring for safety and efficacy is advised (see Dosage and Administration). Interference with Coombs tests may occur, as EPICEPHIN may lead to false-positive test results. EPICEPHIN can also lead to false-positive test results for galactosaemia (see Undesirable Effects). Non-enzymatic methods for the glucose determination in urine may give false-positive results. Urine glucose determination during therapy with EPICEPHIN should be done enzymatically (see Undesirable Effects). The presence of EPICEPHIN may falsely lower estimated blood glucose values obtained with some blood glucose monitoring systems. Please refer to instructions for use for each system. Alternative testing methods should be used if necessary. This should be taken into consideration in patients on a controlled sodium diet. Ceftriaxone has a limited spectrum of antibacterial activity and may not be suitable for use as a single agent for the treatment of some types of infections unless the pathogen has already been confirmed (see Dosage and Administration). In polymicrobial infections, where suspected pathogens include organisms resistant to ceftriaxone, administration of an additional antibiotic should be considered. In case a lidocaine solution is used as a solvent, ceftriaxone solutions must only be used for intramuscular injection. Contraindications to lidocaine, warnings and other relevant information as detailed in the Summary of Product Characteristics of lidocaine must be considered before use (see Contraindications). The lidocaine solution should never be administered intravenously. When shadows are observed on sonograms, consideration should be given to the possibility of precipitates of calcium-ceftriaxone. Shadows, which have been mistaken for gallstones, have been detected on sonograms of the gallbladder and have been observed more frequently at ceftriaxone doses of 1 g per day and above. Caution should be particularly considered in the pediatric population. Such precipitates disappear after discontinuation of ceftriaxone therapy. Rarely precipitates of calcium-ceftriaxone have been associated with symptoms. In symptomatic cases, conservative nonsurgical management is recommended and discontinuation of EPICEPHIN treatment should be considered by the physician based on specific benefit risk assessment(see Undesirable Effects). Cases of pancreatitis, possibly of biliary obstruction aetiology, have been reported in patients treated with ceftriaxone (see Undesirable Effects). Most patients presented with risk factors for biliary stasis and biliary sludge e.g. preceding major therapy, severe illness and total parenteral nutrition. A trigger or cofactor of EPICEPHIN-related biliary precipitation cannot be ruled out. Cases of renal lithiasis have been reported, which is reversible upon discontinuation of ceftriaxone (see Undesirable Effects). In symptomatic cases, sonography should be performed. Use in patients with history of renal lithiasis or with hypercalciuria should be considered by the physician based on specific benefit risk assessment. Concentrations for the intravenous injection: 100 mg/ml. Concentrations for the intravenous infusion: 50 mg/ml. reconstituted medicinal product, see Storage. EPICEPHIN should not be mixed in the same syringe with any drug other than 1% Lidocaine hydrochloride solution (for intramuscular injection only). The infusion line should be flushed after each administration. EPICEPHIN 250 mg, 500 mg, 1 g is dissolved in 2 ml, 2 mL, 3.5 mL respectively of the provided solution, which contains 10 mg of lidocaine hydrochloride monohydrate per mL water for injections. The solution should be administered by deep intramuscular injection. Dosages greater than 1 g should be divided and injected at more than one site. 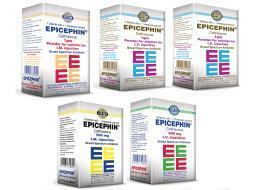 EPICEPHIN 250 mg, 500 mg, 1 g is dissolved in 2.5 ml, 5 mL, 10 ml of the provided water for injections. The injection should be administered over 5 minutes, directly into the vein or via the tubing of an intravenous infusion. The infusion should last at least 30 minutes. For I.V. infusion, 2 g EPICEPHIN is dissolved in 40 ml of one of the following calcium - free infusion solutions: sodium chloride 0.9%, sodium chloride 0.45% + glucose 2.5%, glucose 5%, glucose 10%, dextran 6% in glucose 5%, hydroxyethyl starch 6 – 10%, water for injection. For I.V. infusion, 250 mg EPICEPHIN is diluted by the following solutions: sodium chloride 0.9%, sodium chloride 0.45% + glucose 2.5%, glucose 5%, glucose 10%, dextran 6% in glucose 5%, hydroxyethyl starch 6 – 10%. In neonates, intravenous doses should be given over 60 minutes to reduce the potential risk of bilirubin encephalopathy. Solutions containing EPICEPHIN should not be mixed with or added to other agents except those mentioned in Special Precautions for Disposal. In particular, diluents containing calcium, (e.g. Ringer’s solution, Hartmann’s solution) should not be used to reconstitute EPICEPHIN vials or to further dilute a reconstituted vial for intravenous administration because a precipitate can form. EPICEPHIN must not be mixed or administered simultaneously with calcium-containing solutions including total parenteral nutrition (see Dosage and Administration, Contraindications, Warnings and Precautions, Undesirable Effects). If treatment with a combination of another antibiotic with EPICEPHIN is intended, administration should not occur in the same syringe or in the same infusion solution. This medicinal product must not be mixed with other medicinal products except those mentioned in Special Precautions for Disposal. Calcium-containing diluents, such as Ringer’s solution or Hartmann’s solution, should not be used to reconstitute EPICEPHIN vials or to further dilute a reconstituted vial for intravenous administration because a precipitate can form. Precipitation of ceftriaxone-calcium can also occur when ceftriaxone is mixed with calcium-containing solutions in the same intravenous administration line. EPICEPHIN must not be administered simultaneously with calcium-containing intravenous solutions, including continuous calcium-containing infusions such as parenteral nutrition via a Y-site. However, in patients other than neonates, EPICEPHIN and calcium-containing solutions may be administered sequentially of one another if the infusion lines are thoroughly flushed between infusions with a compatible fluid. In vitro studies using adult and neonatal plasma from umbilical cord blood demonstrated that neonates have an increased risk of precipitation of ceftriaxone-calcium (see Dosage and Administration, Contraindications, Warnings and Precautions, Undesirable Effects, Incompatibilities). Concomitant use with oral anticoagulants may increase the anti-vitamin K effect and the risk of bleeding. It is recommended that the International Normalised Ratio (INR) is monitored frequently and the posology of the anti-vitamin K drug adjusted accordingly, both during and after treatment with EPICEPHIN (see Undesirable Effects). In an in vitro study, antagonistic effects have been observed with the combination of chloramphenicol and ceftriaxone. The clinical relevance of this finding is unknown. Likewise, non-enzymatic methods for glucose determination in urine may yield false-positive results. For this reason, glucose level determination in urine during therapy with EPICEPHIN should be carried out enzymatically. Ceftriaxone crosses the placental barrier. There are limited amounts of data from the use of ceftriaxone in pregnant women. Animal studies do not indicate direct or indirect harmful effects with respect to embryonal/fetal, perinatal and postnatal development. EPICEPHIN should only be administered during pregnancy and in particular in the first trimester of pregnancy if the benefit outweighs the risk. Ceftriaxone is excreted into human milk in low concentrations but at therapeutic doses of ceftriaxone, no effects on the breastfed infants are anticipated. However, a risk of diarrhoea and fungal infection of the mucous membranes cannot be excluded. The possibility of sensitisation should be taken into account. A decision must be made whether to discontinue breastfeeding or to discontinue/abstain from EPICEPHIN therapy, taking into account the benefit of breastfeeding for the child and the benefit of therapy for the woman. During treatment with ceftriaxone, undesirable effects may occur (e.g. dizziness), which may influence the ability to drive and use machines (see Undesirable Effects). Patients should be cautious when driving or operating machinery. The most frequently reported adverse reactions for ceftriaxone are eosinophilia, leucopenia, thrombocytopenia, diarrhoea, rash, and increased hepatic enzymes. Common (≥ 1/100-< 1/10); Uncommon (≥ 1/1000-< 1/100); Rare (≥ 1/10000-< 1/1000); Not knowna (cannot be estimated from the available data). Not known: Haemolytic anaemiab, agranulocytosis. Not known: Anaphylactic shock, anaphylactic reaction, anaphylactoid reaction, hypersensitivityb. Not known: Pancreatitisb, stomatitis, glossitis. Not known: Gall bladder precipitationb, kernicterus. Not known: Stevens Johnson Syndromeb, toxic epidermal necrolysisb, erythema multiforme, acute generalised exanthematous pustulosis. Not known: Oliguria, renal precipitation (reversible). Uncommon: Phlebitis, injection site pain, pyrexia. Not known: False positive coombs testb, false positive galactosaemia testb, false positive non enzymatic methods for glucose determinationb. b See Warnings and Precautions. Reports of diarrhoea following the use of ceftriaxone may be associated with Clostridium difficile. Appropriate fluid and electrolyte management should be instituted (See Warnings and Precautions). Rarely, severe, and in some cases, fatal, adverse reactions have been reported in pre-term and full-term neonates (aged < 28 days) who had been treated with intravenous ceftriaxone and calcium. Precipitations of ceftriaxone-calcium salt have been observed in lung and kidneys post-mortem. The high risk of precipitation in neonates is a result of their low blood volume and the longer half-life of ceftriaxone compared with adults (See Warnings and Precautions, Contraindications, Pharmacokinetic properties). Cases of ceftriaxone precipitation in the urinary tract have been reported, mostly in children treated with high doses (e.g. ≥ 80 mg/kg/day or total doses exceeding 10 grams) and who have other risk factors (e.g. dehydration, confinement to bed). This event may be asymptomatic or symptomatic, and may lead to ureteric obstruction and postrenal acute renal failure, but is usually reversible upon discontinuation of ceftriaxone (See Warnings and Precautions). Precipitation of ceftriaxone calcium salt in the gallbladder has been observed, primarily in patients treated with doses higher than the recommended standard dose. In children, prospective studies have shown a variable incidence of precipitation with intravenous application - above 30 % in some studies. The incidence appears to be lower with slow infusion (20-30 minutes). This effect is usually asymptomatic, but the precipitations have been accompanied by clinical symptoms such as pain, nausea and vomiting in rare cases. Symptomatic treatment is recommended in these cases. Precipitation is usually reversible upon discontinuation of ceftriaxone (See Warnings and Precautions). In overdose, the symptoms of nausea, vomiting and diarrhoea can occur. Ceftriaxone concentrations cannot be reduced by haemodialysis or peritoneal dialysis. There is no specific antidote. Treatment of overdose should be symptomatic. Pharmacotherapeutic group: Antibacterials for systemic use; Third-generation cephalosporins. Hydrolysis by beta-lactamases, including extended-spectrum beta-lactamases (ESBLs), carbapenemases and Amp C enzymes that may be induced or stably derepressed in certain aerobic Gram-negative bacterial species. Reduced affinity of penicillin-binding proteins for ceftriaxone. Outer membrane impermeability in Gram-negative organisms. + Resistance rates >50% in at least one region. Following intramuscular injection, mean peak plasma ceftriaxone levels are approximately half those observed after intravenous administration of an equivalent dose. The maximum plasma concentration after a single intramuscular dose of 1 g is about 81 mg/l and is reached in 2-3 hours after administration. The volume of distribution of ceftriaxone is 7-12 l. Concentrations well above the minimal inhibitory concentrations of most relevant pathogens are detectable in tissue including lung, heart, biliary tract/liver, tonsil, middle ear and nasal mucosa, bone, and in cerebrospinal, pleural, prostatic and synovial fluids. An 8-15 % increase in mean peak plasma concentration (Cmax) is seen on repeated administration; steady state is reached in most cases within 48-72 hours depending on the route of administration. Ceftriaxone penetrates the meninges. Penetration is greatest when the meninges are inflamed. Mean peak ceftriaxone concentrations in CSF in patients with bacterial meningitis are reported to be up to 25 % of plasma levels compared to 2 % of plasma levels in patients with uninflamed meninges. Peak ceftriaxone concentrations in CSF are reached approximately 4-6 hours after intravenous injection. Ceftriaxone crosses the placental barrier and is excreted in the breast milk at low concentrations (See Pregnancy, Lactation and Fertility). Plasma clearance of total ceftriaxone (bound and unbound) is 10-22 ml/min. Renal clearance is 5-12 ml/min. 50-60 % of ceftriaxone is excreted unchanged in the urine, primarily by glomerular filtration, while 40-50 % is excreted unchanged in the bile. The elimination half-life of total ceftriaxone in adults is about 8 hours. The pharmacokinetics of ceftriaxone are non-linear and all basic pharmacokinetic parameters, except the elimination half-life, are dose-dependent if based on total drug concentrations, increasing less than proportionally with dose. Non-linearity is due to saturation of plasma protein binding and is therefore observed for total plasma ceftriaxone but not for free (unbound) ceftriaxone. Store at a temperature not exceeding 30ºC. After reconstitution it should be stored at temperature 2ºC - 8ºC for 24 hours. EPICEPHIN 250 mg Vials: Box containing 1 vial + 1 ampoule (2 ml) of 1% Lidocaine hydrochloride solvent. EPICEPHIN 500 mg Vials: Box containing 1 vial + 1 ampoule (2 ml) of 1% Lidocaine hydrochloride solvent. EPICEPHIN 1 g Vials: Box containing 1 vial + 1 ampoule (3.5 ml) of 1% Lidocaine hydrochloride solvent. EPICEPHIN 250 mg Vials: Box containing 1 vial + 1 ampoule (5 ml) of (Sterile Water for Injection) solvent. EPICEPHIN 500 mg Vials: Box containing 1 vial + 1 ampoule (5 ml) of (Sterile Water for Injection) solvent. EPICEPHIN 1 g Vials: Box containing 1 vial + 1 ampoule (10 ml) of (Sterile Water for Injection) solvent. EPICEPHIN 2 g Vials: Box containing 1 vial + 1 ampoules (10 ml) of (Sterile Water for Injection) solvent.